Ok, I am at a complete loss as to how to proceed on this level after finishing with the secret, and taking care of the rocks and holez next to it....I have tried sending gauntletz in first, to go down and to the right. Shovelz in the middle, and barehanded to the left to get the gravity boots. I have gotten as far as sending gauntletz down to kill all the yellow spongegunz and break all the rocks, sending gravity over the ? to the breakable bridgez and the coins, getting the warpletter, and down to the area below the tarpit. Then, it all becomes a blur....how about some clarification here? You should have three Gruntz together at the central western part of the map. Two will go through the Arrowz maze, while one (SpongeGunz) turns the enemy Sword Object Guard into Goo. I believe that you would have Wingz, Gauntletz and SpongeGun Grunt in that area, and find a Shovel somewhere later. How do I get the spongegun over to that area? I can get the wings and gauntletz but the spongegun is stuck in his area. Walk over the Spikez to the opening in the Trees, towards the enemy Sword-carrying Object Guard. Shoot where the SOG will be in three (or four) Tilez, not directly at the SOG. No, I mean that my shovelz gruntz is trapped up in the area where the purple pyramid switch is, where he first entered the middle area where there were two purple spongegunz surrounded by three holes and two rolling snowballz....maybe he should not have gone in there to start ? I sent the gauntletz in there to help him and stand on the purple switch so that the sholvez can go down, get the spongegun and shoot the gauntletz over the arrow to the area due east with the green switch...does this make any sense? Eventually, both the Shovel Grunt and the Gauntletz Grunt will enter that area. They will turn many of the opposing disGruntledz into Goo Puddlez ... but not all of them ... or you will never get back out, when you are ready to leave. Shovel has to avoid the flying Spongez, while filling in Holez so he can reach the SpongeGunz Gruntz in order to whack some sense into them (and a lot of Goo out of them ). There are Crystal Rockz that Gauntletz will need to break ... that's why you need both Gruntz in there together. This Custom Level will teach you more than you ever wanted to know about fighting enemy (dsiGruntled) Gruntz or all varieties. You'll wish you were a spider (eight eyes, for watching in all directions), when those Hit and Runnerz are making your life miserable! I am hopelessly lost now...I think I'll wait for a walkthrough....from the beginning. I get messed up when it's time to move my shovelz, gauntletz and barehanded down to the next puzzle....I can get the gauntletz and wingz to the right area, but my shovelz/spongegunz is trapped because I killed all of the purple spongegunz...I think I have an idea of what to do and will have to work on this one for awhile. Some CL's I can figure out, but some have tight timed puzzles or require a specific strategy to complete, I think this is one of them....thanks anyway. Well, I sat down today and waltzed through that problem area like I had been there before, which I had, just never figured it out ....and now I 've gotten my gauntletz into a pickle...got him to the red warp area with the purple boxers...and when I smash the rockz there are four arrowz squarez...which I totally ignored...went up and stepped on the BOTS at the top right, went across the bridge, stepped on the second BOTS, and smashed the rock...got the rockz gruntz to follow me to the blue toggle switch, but he won't stay there long enough for me to cross the bridge to the timer pyramidz....so where did I go wrong? Is the Rockz Grunt TOYing with you ... or are you TOYing with him? The answer will probably pop out at you, when you really think about it. There is a row of rockz above the pool at the upper left....is there a secret to thoze? Once I get the Perfect! I'll be a happy Gruntzer! I am replaying it too, taking more time to investigate different things...The island is on the right side, as well as the "R"...and I haven't gotten that far yet...let me know if you find something...thanks GooRoo! Yup, that's where it was...great level...Perfect! in 53:00...onward Gruntz! I don't, WalkingBear, I can't seem to even get as far as you in your first query. I am so confused, about that first part. I went through the rolling balls all right and even found the first red warp, but then sending the three into that next part seems confusing to me. I know the bare handed one has to get the gravity bootz and go through to the purple switch and secret switch. But what do the shovel and gauntletz do? I've had them both doing different things and each time one gets stuck somewhere he shouldn't. I'll think I see the solution, but then it never works. I'm really tired of it now. Please help, somebody! You have sent the gauntletz to the west, to break the rock next to the spongegun at the far left of the area below the rolling rocks...and then he went to the rolling rock area to break all the rocks...while he was there he tripped the red warp...and you got the coinz...now send him to wait at the yellow switch at the entrance to the area below...out of reach of those spongegunz, ok? Then, you sent another grunt to pick up the shovel, who dug up the holez, and lost some of the snowballs...found the coin? Send him to wait with gauntletz. Walk gauntletz down to break that big rock mountain at the bottom of the area...then across to the two vertical rollng snowballz...carefully make your way up to the top, break the rock and get the coin...don't forget to step on that Black One Time Switch (BOTS) in the middle. When you get to the bottom...all the while keeping out of the way of that blasted spongegun, step on the green switch at the bottom and watch out....! There are several yellow spongegun gruntz in that area and they move around! Break all the rockz in this area, avoiding the gruntz and killing them as you go along, pick up the coinz and the jack-in-the-box too, you'll need it later. Now send shovelz across the yellow two way switch and wait next to the left pointing arrow. Shovelz movez into the area, avoiding the rolling ballz...and across the pyramidz and fillz in some holez so he can kill that enemy near the purple switch! Thanks so much WalkingBear I still felt confused until I overcame my mental block about enemies being my friend sometimes. I don't think I ever would have thought to have the enemy spongunz shoot me over the arrows (even though GooRoo mentioned it), and yet they did it in "The final battle." I'm going to have to keep a little notebook with these tips in it. Finished the level, found all the secrets, but still missed two coins Oh well, I'll get 'em the next time I do the level. Thanks everybody! Hi WalkingBear. 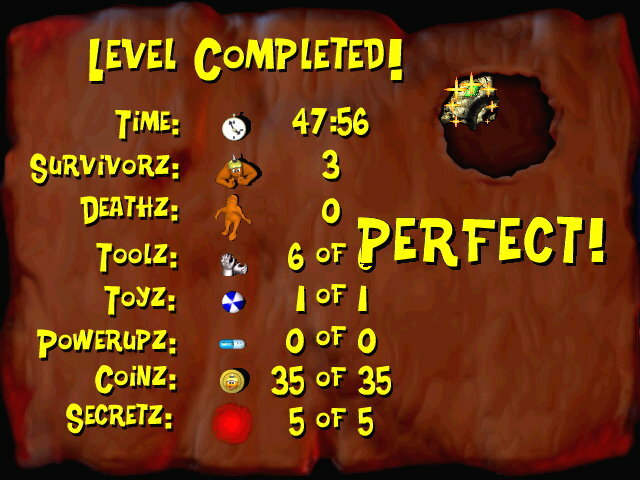 You say you acheived a perfect in this Level. I have played this twice, but managed 35 out of 37 coins. Maybe I missed the coins or I have the wrong CL. Is the CL here with 37 coins? If yes, i will download it again and paly to get that PERFECT score! Rohit, I would not announce a PERFECT! score unless I actually achieved it....look under rockz, dig up holez, check behind treez....some designerz are very clever at hiding useful and valuable thingz.